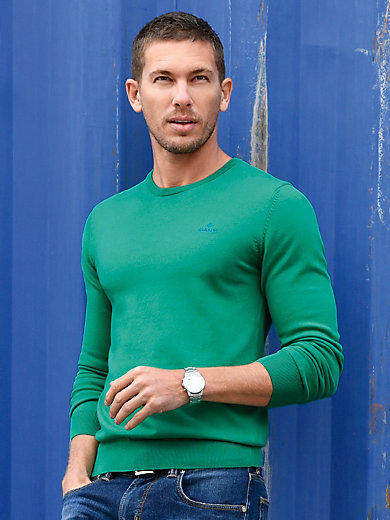 Round neck pullover by GANT: sporty basic in breathable summer material and a new trend colour! Goes with countless different outfits for smart, summery look. Embroidered logo in a contrasting colour at the front. 90% cotton, 10% polyamide. The round neck pullover is machine washable. Sizes: 48 (S), 50 (M), 52 (L), 54 (XL), 56 (XXL), 58 (XXXL).